These are new plants in the garden as of 5/13/2010. There are both male (top) and female (bottom) plants. The boys have flowers; the girls have berries. Skimmia is a wonderful winter shade plant. 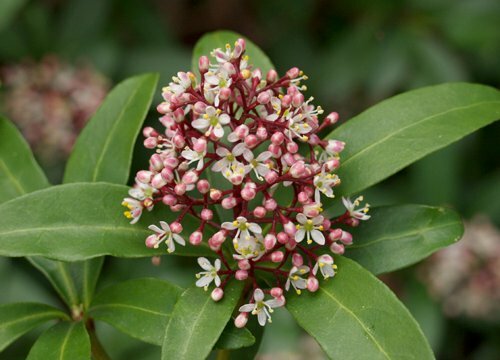 Handsome dark green leaves; showy white spring flowers and attractive bright red berries combine to make skimmia an ideal plant for the winter shade garden. Skimmia has a compact, bushy growth habit and the dark green foliage provides an excellent background for the showy flowers and berries. 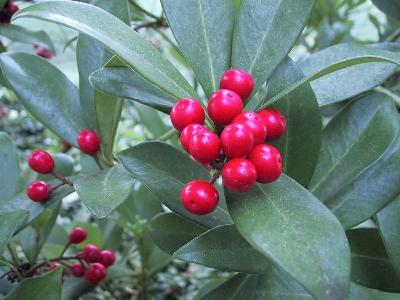 Cut branches with berries are sometimes used as a substitute for holly, during the holiday season. The cut branches can also be used in flower arrangements, with berries or flowers or as a filler.